Hepatocellular carcinoma (HCC) is one of the most prevalent malignancies worldwide because of rapid progression and high incidence of metastasis or recurrence. Accumulating evidence shows that CD73-expressing tumor cell is implicated in development of several types of cancer. However, the role of CD73 in HCC cell has not been systematically investigated and its underlying mechanism remains elusive. CD73 expression in HCC cell was determined by RT-PCR, Western blot, and immunohistochemistry staining. Clinical significance of CD73 was evaluated by Cox regression analysis. Cell counting kit-8 and colony formation assays were used for proliferation evaluation. Transwell assays were used for motility evaluations. Co-immunoprecipitation, cytosolic and plasma membrane fractionation separation, and ELISA were applied for evaluating membrane localization of P110β and its catalytic activity. 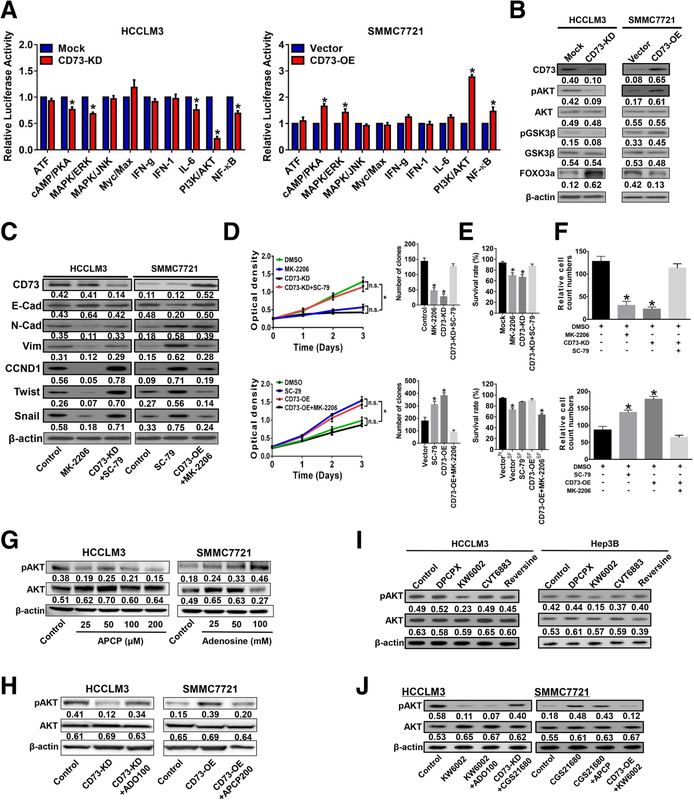 NOD/SCID/γc(null) (NOG) mice model was used to investigate the in vivo functions of CD73. In the present study, we demonstrate that CD73 was crucial for epithelial-mesenchymal transition (EMT), progression and metastasis in HCC. CD73 expression is increased in HCC cells and correlated with aggressive clinicopathological characteristics. Clinically, CD73 is identified as an independent poor prognostic indicator for both time to recurrence and overall survival. 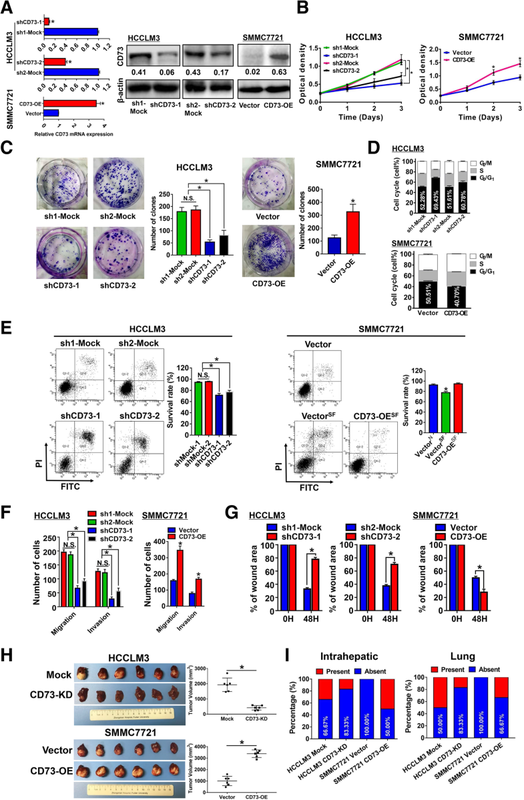 CD73 knockdown dramatically inhibits HCC cells proliferation, migration, invasion, and EMT in vitro and hinders tumor growth and metastasis in vivo. Opposite results could be observed when CD73 is overexpressed. Mechanistically, adenosine produced by CD73 binds to adenosine A2A receptor (A2AR) and activates Rap1, which recruits P110β to the plasma membrane and triggers PIP3 production, thereby promoting AKT phosphorylation in HCC cells. Notably, a combination of anti-CD73 and anti-A2AR achieves synergistic depression effects on HCC growth and metastasis than single agent alone. CD73 promotes progression and metastasis through activating PI3K/AKT signaling, indicating a novel prognostic biomarker for HCC. Our data demonstrate the importance of CD73 in HCC in addition to its immunosuppressive functions and revealed that co-targeting CD73 and A2AR strategy may be a promising novel therapeutic strategy for future HCC management. Xiao-Lu Ma, Min-Na Shen and Bo Hu contributed equally to this work. The online version of this article ( https://doi.org/10.1186/s13045-019-0724-7) contains supplementary material, which is available to authorized users. Hepatocellular carcinoma (HCC) is one of the most prevalent malignancies worldwide and the second most common cause of cancer-related death [1, 2]. Although great improvements in treatment have been made, the prognosis of HCC remains unfavorable, with an approximate 30% overall 5-year survival rate even after curative resection [3, 4, 5]. Recurrence or metastasis is the major reason for the poor survival of HCC patients [6, 7], but the precise regulatory mechanisms of invasion and metastasis remain elusive. Therefore, identification of critical molecules that contribute to the invasive phenotype of HCC and clarification of the underlying mechanism are urgently needed to improve HCC prognosis. CD73, an AMP hydrolyzing enzyme that regulates the conversion of extracellular ATP into adenosine, functions as a powerful immunosuppressor for maintaining tissue homeostasis and preventing immune responses during inflammation . Accumulating evidence demonstrates the vital role of CD73 in tumor [9, 10]. Hematopoietic CD73 overexpression within the tumor microenvironment is observed in a variety of cancers, and these CD73-expressing cells hamper the immune reaction towards cancer cells and disable the cytotoxic antitumor immune response by producing high levels of adenosine [11, 12, 13, 14]. CD73 expressed on hematopoietic cells can also function as a co-stimulatory molecule in human T cells to block CD8+ T cell activation . Recent reports also demonstrated that CD73 overexpression is involved in migration, invasion, and angiogenesis [15, 16, 17, 18]. Moreover, clinical data demonstrated that CD73 is a biomarker of poor prognosis in solid cancers [19, 20, 21]. These investigations suggested that CD73 could be a critical regulator that promotes tumor progression in an immune-independent manner. A preliminary study reported that CD73 was overexpressed in HCC cells and was positively correlated with EGFR expression . However, whether CD73 could promote HCC progression and metastasis and the underlying regulatory mechanism still needs to be elucidated. Here, we report that CD73 expression is positively correlated with metastasis in HCC and is an independent indicator for predicting prognosis. CD73 overexpression enhanced HCC progression and metastasis in the absence of an immunological environment in vitro and in vivo. Adenosine produced by CD73 binds to adenosine A2A receptor (A2AR) and activates Rap1, which recruits P110β to the plasma membrane and triggers PIP3 production, thereby promoting AKT phosphorylation. Importantly, the combination of CD73 and A2AR inhibitors provided more synergistic tumor inhibition than either regimen alone in HCC. Four groups of patients were recruited in the present study. In group I, frozen tumor tissues with paired paratumor normal tissues from 25 HCC patients receiving curative resection in October 2010 in Zhongshan Hospital were collected for comparisons of CD73 expression between matched tumor and paratumor tissues by RT-PCR and Western blot (WB) assays. In group II, eight recurrent HCC patients receiving curative resection from April to November 2014 in Zhongshan Hospital were enrolled, and matched frozen paratumor, primary tumor, and recurrent tumor tissues were collected for further WB assays. In group III, 10 HCC patients suffered lung metastasis after curative resection from 2011 to 2015 in Zhongshan hospital were enrolled, and matched paraffin sections of paratumor, primary tumor, and metastatic tumor tissues were collected for further immunohistochemical staining. In group IV, 189 HCC patients receiving curative resection in Zhongshan Hospital from March 2012 to September 2013 were enrolled, and paratumor and tumor specimens were collected for tissue microarrays (TMA) establishment. Enrollment criteria were according to a previous study . HCC diagnosis was based on histopathology according to the American Association for Study of Liver Disease guidelines. The Barcelona Clinic Liver Cancer (BCLC) staging system was used to assess tumor stage . Approval for the use of human subjects was obtained from the research ethics committee of Zhongshan Hospital, and informed consent was obtained from each individual. Follow-up ended on December 2016. Time to recurrence (TTR) was defined as the interval between treatment and intrahepatic recurrence or extrahepatic metastasis. Overall survival (OS) was defined as the interval between treatment and death of any cause or the last observation date. Statistical analyses were performed using SPSS 20.0 software (IBM, Chicago, IL, USA). Experimental values for continuous variables were expressed as the mean ± standard error of the mean. The chi-squared test, Fisher’s exact probability tests, and the Student’s t test were used as appropriate to evaluate the significance of differences in data between groups. If variances within groups were not homogeneous, a nonparametric Mann–Whitney test or a Wilcoxon signed-rank test was used. Prognostic value was evaluated by Kaplan–Meier survival curves, log-rank tests, and Cox proportional hazards models. A P value less than 0.05 was considered significant. Further details of materials and methods are described in Additional file 1. CD73 expression was markedly higher in 55% of HCC tissues than paired adjacent normal liver tissues (Additional file 2: Figure S1A). WB assays confirmed the RT-PCR findings (Fig. 1b). Moreover, immunohistochemistry (IHC) staining was conducted with 189 HCC patients receiving curative resection, and results showed that HCC tissues expressed higher level of CD73 than adjacent non-cancerous liver tissues, according to the criteria of CD73 expression levels (Fig. 1c). These data revealed the potential oncogenic role of CD73 in HCC. Next, the correlation between CD73 and HCC prognosis was evaluated. Samples from eight recurrent patients were collected. WB assays showed that expression levels of CD73 in matched non-tumor, primary tumor, and recurrence lesions exhibited an escalating pattern in most patients (Fig. 1d). For patients with metastasis, the CD73 expression level of metastasis foci was also significantly elevated according to IHC results (n = 10, Fig. 1e). Moreover, we found patients with high CD73 were prone to show incomplete tumor encapsulation, microvascular invasion, and poor differentiation (all P < 0.050, Table 1). Median TTR was significantly shorter in patients with high CD73 expression (median 25.73 months vs. not reached, P < 0.001, Fig. 1f), and the recurrence rate was also higher in these patients (70.45% vs. 45.54%, Fig. 1g). Similarly, patients with high CD73 expression had significantly shorter OS (median 38.88 months vs. not reached, P < 0.001) and a higher death rate (57.95% vs. 21.78%). Furthermore, CD73 retained its prognostic prediction value in early-stage and low-AFP subgroups (all P < 0.050, Additional file 2: Figure S1A–D). Notably, multivariate analysis demonstrated high CD73 expression on HCC cell and was an independent indicator for predicting both TTR [HR 2.82 (1.87–4.26), P < 0.001] and OS [HR 3.35 (2.01–5.52), P < 0.001, Tables 2 and 3]. Intriguingly, patients with high CD73 had significantly higher pre-treatment circulating tumor cell (CTC) load (P < 0.001, Fig. 1h). Using 0.80 as the cutoff value for CTC load , a higher proportion of patients in the CD73high group had high CTC loads (Fig. 1h). Notably, CD73 showed elevated expression in MHCC97H and HCCLM3 cells, which have higher invasive and metastatic potentials (Fig. 1i). In comparison, cell lines with lower invasive and metastatic capacities such as SMMC7721 and MHCC97L showed relatively low CD73 levels. Collectively, our data demonstrated the clinical significance of CD73 and suggested it as a potential promoter for HCC metastasis/recurrence. CD73 expression in HCC cell lines was manipulated by ectopic expression or short hairpin RNA (shRNA) knockdown. Two distinct shRNAs were designed to knock down CD73 expression in two CD73high HCC cell lines, HCCLM3 and Hep3B cells. Knockdown effects were validated by RT-PCR and WB assays (Fig. 2a, Additional file 3: Figure S2A). Stable ectopic expression of CD73 in a CD73low HCC cell line, SMMC7721, was also confirmed by RT-PCR and WB assays. We found CD73KD HCCLM3 cells exhibited significantly decreased proliferation potential compared with controls according to CCK-8 and colony formation assays (Fig. 2b and c). Similar reduced proliferation was observed in Hep3B cells (Additional file 3: Figure S2B). In contrast, overexpression of CD73 in SMMC7721 cells increased their proliferation in CCK-8 assays and clonogenicity capacity (Fig. 2b and c). Cell cycle assays demonstrated that CD73 knockdown resulted in G0/G1 arrest in HCC cells (Fig. 2d, Additional file 3: Figure S2C), while CD73 overexpression accelerated the cell cycle in SMMC7721 cells (Fig. 2d). Apoptosis assays further showed that CD73 knockdown greatly induced apoptosis in HCC cells, while CD73 overexpression protected SMMC7721 cells from a serum-free environment (Fig. 2e, Additional file 3: Figure S2D). Transwell assays showed that CD73 knockdown HCC cells had significantly fewer migrating and invading cells than parental cells, while CD73OE SMMC7721 significantly higher migratory and invasive capacities (Fig. 2f, Additional file 4: Figure S3A and B). Moreover, wound healing assays confirmed the findings of Transwell assays that knockdown of CD73 greatly hindered HCC migration, while overexpression of CD73 promoted migratory potentials (Fig. 2g, Additional file 4: Figure S3C). Importantly, we also conducted CD73 overexpression in HCCLM3 cells to confirm that the difference observed above was not due to the variability between cell lines. CD73 expression was greatly increased after plasmid transfection in HCCLM3 cells (Additional file 5: Figure S4A). Similar to the effects of CD73 overexpression on SMMC7721 cells, forced expression of CD73 also significantly promoted proliferation, migration, and invasion capacities in HCCLM3 cells (Additional file 5: Figure S4B–D). However, no significant alteration of apoptosis and cell cycle was observed after CD73 overexpression (Additional file 5: Figure S4E and F). 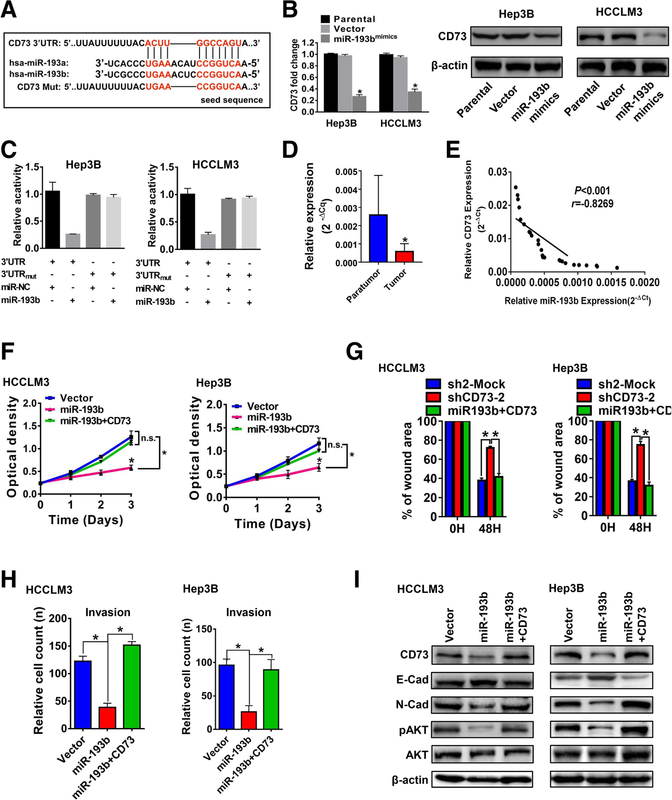 Taken together, our data indicated that CD73 promotes HCC cell proliferation, migration, and invasion capacities and prevents apoptosis in vitro. Since shCD73-1 exhibited more efficiency in knocking down CD73 expression and resulting in more significant biological alterations, further in vivo experiments and mechanism investigation were conducted using this shRNA. To minimize the impact of the immune system, NOG mice were used. Model mice were sacrificed after 6 weeks, and analyses of liver orthotopic xenograft tumors showed that CD73 knockdown greatly inhibited tumor growth, whereas CD73 overexpression promoted tumor growth in vivo (Fig. 2h). Moreover, tumor tissues with high CD73 expression also exhibited high proliferating cell nuclear antigen levels (Additional file 6: Figure S5A). Metastatic foci were examined based on their tissue structure and cell morphology by two senior histopathologists to evaluate the effects of CD73 on HCC metastasis. Both the intrahepatic and pulmonary metastasis rates in mice with tumors generated from CD73KD HCCLM3 cells were lower than in mice with tumors derived from parental HCCLM3 cells (Fig. 2i, Additional file 6: Figure S5B and C). In contrast, both intrahepatic and pulmonary metastasis rates were increased in tumors derived from CD73OE SMMC7721 cells compared with parental SMMC7721 cells. Collectively, our data demonstrated that CD73 promotes HCC proliferation and metastasis in vivo. We further examined whether CD73 contributes to EMT. Through phalloidin staining, we found CD73KD HCCLM3 cells showed an epithelial cobblestone phenotype with less pseudopod, whereas CD73OE SMMC7721 cells transformed into a spindle-like shape with more pseudopods (Fig. 3a). Moreover, CD73 knockdown resulted in an epithelial-like molecular phenotype, while CD73 overexpression induced a mesenchymal-like molecular phenotype according to RT-PCR and WB results (Fig. 3b and c). Consistently, immunofluorescence analysis confirmed these findings (Fig. 3d). 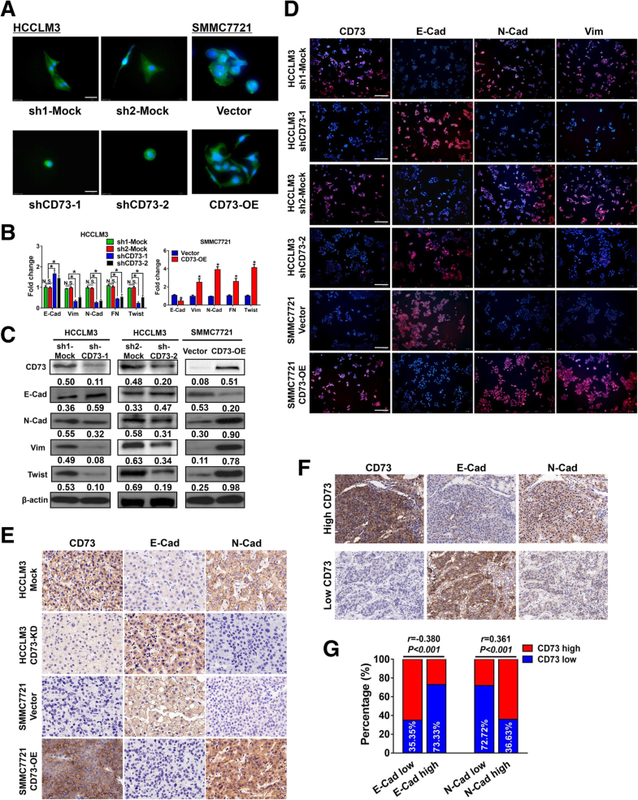 Moreover, xenograft tumors generated from CD73KD HCCLM3 cells exhibited an epithelial-like phenotype, while tumors derived from CD73OE SMMC7721 cells showed a mesenchymal-like phenotype according to IHC staining (Fig. 3e). We next examined the correlation between CD73 and EMT in a clinical cohort. IHC staining in HCC consecutive sections indicated that high CD73 expression was correlated with low level of E-Cadherin but high level of N-Cadherin, and vice versa in HCC tissue with low CD73 expression (Fig. 3f). Notably, correlation analysis revealed that high CD73 expression was positively correlated with N-Cadherin but negatively correlated with E-Cadherin expression in clinical HCC samples (Fig. 3g). Collectively, our results suggested that CD73 is a critical regulator of EMT in HCC. To identify the underlying signaling of CD73 in HCC, Cignal Finder RTK signaling 10-Pathway Reporter Array was used and results showed that PI3K/AKT signaling exhibited the greatest fold changes due to CD73 expression manipulation (Fig. 4a). We therefore examined the PI3K/AKT pathway as a candidate critical signaling pathway. WB assays in HCC cells with CD73 knockdown confirmed that phosphorylation levels of AKT and GSK3β, a direct substrate of pAKT, were reduced (Fig. 4b). In addition, expression of FOXO3a, which would undergo degradation due to AKT activation, was also increased after CD73 knockdown. In contrast, pAKT and pGSK3β levels were and increased, while FOXO3a was decreased with ectopic expression of CD73 in SMMC7721 cells (Fig. 4b). We next examined whether the effects of CD73 on HCC cell activities were dependent on PI3K/AKT signaling. Treatment of HCCLM3 cells with MK-2206, an AKT inhibitor, resulted in an epithelial-like molecular phenotype, which resembled the phenotype of CD73KD HCCLM3 cells (Fig. 4c, Additional file 7: Figure S6A). Treatment of SMMC7721 cells with SC-79, an AKT activator, resulted in a mesenchymal-like phenotype that resembled the phenotype of CD73OE SMMC7721 cells. Importantly, reactivation of AKT signaling in CD73KD HCCLM3 cells effectively attenuated the epithelial-induction effect, while inhibition of AKT signaling in CD73OE SMMC7721 cells prevented the mesenchymal-induction effect (Fig. 4c). Also, biological experiments showed that AKT inhibition hindered proliferation and invasion capacities and promoted apoptosis in CD73high HCCLM3 cells to levels observed in CD73 knockdown cells, while AKT activation promoted proliferation and invasion capacities and prevented apoptosis in CD73low SMMC7721 cells to levels observed in cells with CD73 overexpression (Fig. 4d–f, Additional file 7: Figure S6B–D). Notably, AKT inhibition abolished the effects of CD73 overexpression on HCC proliferation and invasion, whereas AKT activation attenuated the inhibitory effects of CD73 knockdown on HCC proliferation and invasion. These results indicated that CD73 promotes HCC progression and EMT by activating PI3K/AKT signaling. We next investigated whether the enzymatic activity of CD73 was required for its function in promoting progression and metastasis in HCC by using APCP, a CD73 enzyme activity inhibitor. APCP treatment of CD73high HCCLM3 cells reduced pAKT levels in a dose-dependent manner (Fig. 4g). Contrarily, exogenous adenosine treatment of CD73low SMMC7721 cells increased pAKT in a dose-dependent manner. Notably, adenosine could restore the reduction of pAKT caused by CD73 knockdown, while APCP treatment could partly abolish the increase of pAKT caused by CD73 overexpression (Fig. 4h). Functionally, APCP produced similar inhibitory effects on proliferation and invasion, induced an epithelial-like phenotype in HCCLM3 cells as observed in CD73 knockdown cells, and abolished the effects of CD73 overexpression (Additional file 8: Figure S7A-C), whereas adenosine promoted proliferation and invasion, induced a mesenchymal-like phenotype in SMMC7721 cells as observed in CD73 overexpression cells, and attenuated the effects of CD73 knockdown (Additional file 8: Figure S7D–F). Collectively, our data demonstrated that CD73 functions in HCC require its enzymatic activity. We next searched for the adenosine receptor involved in mediating the functions of CD73 in HCC using selective inhibitors targeting adenosine A1 (DPCPX), A2A (KW6002), A2B (CVT6883), and A3 receptors (Reversine). 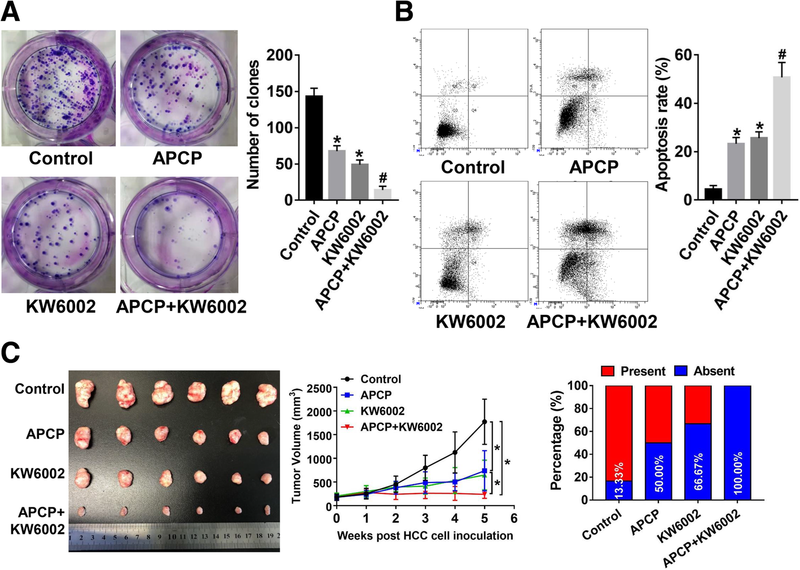 Only KW6002 reduced AKT phosphorylation in both CD73high HCC cell lines (Fig. 4i). Furthermore, KW6002 inhibited HCC proliferation and invasion to the maximum extent and induced an epithelial-like phenotype (Additional file 9: Figure S8A–F). We thus focused on A2A receptor (A2AR) for further investigation. Inhibition effects of A2AR on pAKT level could not be rescued by exogenous adenosine, while APCP failed to abolish the increase of pAKT resulting from using CGS21650, a selective A2AR agonist (Fig. 4j). Importantly, A2AR agonist could effectively restore the reduction of pAKT caused by CD73 knockdown, while A2AR antagonist greatly abolished the increase of pAKT resulting from CD73 overexpression (Fig. 4j). These data demonstrated that CD73 exerts its function in HCC through A2AR. Adenosine A2AR belongs to the G-protein-coupled receptor family, which is closely associated with the activation of Rap1 . Previous studies showed that Rap1 is a critical regulator of PI3K activity [26, 27]. We therefore hypothesized that the CD73-A2AR axis might activate PI3K/AKT signaling by inducing Rap1 activation. We first assessed the effects of the CD73-A2AR axis on Rap1 activation. CD73 knockdown or A2AR antagonist greatly reduced the level of Rap1-GTP, an active form of Rap1, while A2AR agonist restored the reduction of Rap1-GTP level caused by CD73 knockdown in HCCLM3 cells (Fig. 5a). Conversely, CD73 overexpression or A2AR agonist increased Rap1-GTP, while A2AR antagonist abolished the increase of Rap1-GTP level resulting from CD73 overexpression. We next determined the role of Rap1 activation in AKT phosphorylation via manipulating Rap1 expression (Fig. 5b). In HCCLM3 cells, Rap1 knockdown dramatically decreased pAKT levels, which could not be rescued by CGS21680 treatment (Fig. 5c). However, transfection of Rap1G12V, a constitutively active mutant, attenuated the reduction of pAKT level caused by CD73 knockdown or A2AR antagonist. Moreover, transfection of Rap1S17N, a dominant negative mutant, failed to restore the inhibitory effects of Rap1 knockdown on pAKT levels (Fig. 5c). In SMMC7721 cells, transfection of Rap1G12V greatly increased pAKT levels, which could not be abolished by A2AR antagonist. However, CD73 overexpression or A2AR agonist showed no effects on pAKT level when Rap1 was knocked down. In addition, Rap1G12V expression rescued the inhibition of AKT activation caused by Rap1 knockdown (Fig. 5c). Importantly, through analyzing cytosolic and plasma membrane fractions, we found that the majority of Rap1 was recruited to the membrane after activation by the CD73-A2AR axis (Fig. 5d), which was consistent with a previous study . These results indicate that Rap1 serves as a key downstream regulator of the CD73-A2AR axis and that activation of Rap1 is essential for CD73-A2AR axis mediating AKT phosphorylation in HCC. Previous studies reported that Rap1 could bind to Class I PI3Ks to promote PIP3 production, resulting in AKT activation [26, 27]. Thus we hypothesized that CD73-A2AR axis activates AKT signaling via promoting interaction between Class I PI3K member and Rap1. First, to identify the key involved Class I PI3K member, we silenced two major Class I PI3Ks, P110α, and P110β, in HCCLM3 cells and found that P110β knockdown resulted in a dramatic reduction of pAKT levels (Additional file 10: Figure S9A). Similar results were observed in Hep3B cells (Additional file 10: Figure S9B). These results suggested a critical role for P110β in CD73-mediated AKT activation in HCC. Next, Co-IP experiments in 293 T cells co-transfected with HA-P110β and either Flag-Rap1G12V or Flag-Rap1S12N showed that only activated form Rap1 could interact with P110β (Fig. 5e). Notably, level of intracellular PIP3 and pAKT only elevated when Rap1 binding to P110β, implying a requirement for this interaction in promoting catalytic activity of P110β (Additional file 10: Figure S9C, D). Above data demonstrated the significance of the interaction between Rap1 and P110β in regulating AKT activation. Next, the role of CD73-A2AR axis in promoting endogenous Rap1-P110β interaction was further validated by co-IP assays. CD73 knockdown or A2AR antagonist greatly hindered the Rap1-P110β interaction, whereas A2AR agonist successfully rescued the inhibition of Rap1-P110β interaction caused by CD73 knockdown in HCCLM3 cells (Fig. 5f). Contrarily, CD73 overexpression or A2AR agonist promoted the Rap1-P110β interaction, while A2AR antagonist dramatically inhibited the effects of CD73 overexpression on promoting Rap1-P110β binding in SMMC7721 cells. Our findings indicate that CD73-A2AR serves as an upstream promoter of the Rap1-P110β interaction, resulting in PIP3 production and AKT phosphorylation. As our results showed that activated Rap1 was recruited to the membrane, and Rap1 binds to P110β, we further evaluated whether CD73-A2AR could induce P110β membrane localization, a critical process for its catalytic function , in a Rap1-dependent manner. Through analyzing cytosolic and plasma membrane fractions by WB assays, we found that, similar to the effect of Rap1 knockdown, CD73 knockdown or A2AR antagonist greatly reduced the plasma membrane localization of P110β in HCCLM3 cells, and this could be rescued by Rap1G12V expression (Fig. 5g). On the other hand, consistent with the results of Rap1G12V transfection, CD73 overexpression or A2AR agonist promoted plasma membrane localization of P110β in SMMC7721 cells, and this was greatly abolished by Rap1 knockdown. Notably, higher PIP3 concentrations and pAKT levels were observed when the majority of P110β localized on plasma membrane (Fig. 5g), indicating abundant catalytic activity of P110β under these circumstances. Assays were further performed and results further confirmed the membranous co-localization of Rap1-P110β due to CD73-A2AR axis regulation, which was consistent with the results of WB assays (Fig. 5h). These data demonstrated that the CD73-A2AR axis activates AKT by inducing Rap1-mediated membrane localization of P110β. Previous studies revealed miRNA was responsible for the dysregulation of CD73 expression [30, 31]. We further investigated the potential upstream miRNA of CD73 in HCC. Seven microRNAs were predicted by two bioinformatics algorithms (TargetScan and miRanda) to be potential upstream regulators of CD73 according to StarBase database  (Additional file 11: Figure S10A). Among these potential miRNAs, two homologous miRNAs, miR-193a and miR-193b were selected for further study, as previous studies reported them as tumor suppressors in HCC [33, 34]. A putative binding site of miR-193a/miR-193b and 3′UTR of CD73 was identified (Fig. 6a). Transfection of miR-193b mimics significantly reduced CD73 expression in two CD73high cell lines (Fig. 6b). However, miR-193a mimics failed to exert similar effects (Additional file 11: Figure S10B), and thus, miR-193b was identified as the potential regulator for CD73 expression in our study. To validate its regulatory role, dual luciferase reporter assays were firstly performed and results revealed that miR-193b markedly inhibited the activity of a luciferase vector containing the wild-type CD73 3′UTR, but not the mutant 3′UTR (Fig. 6c). Moreover, miR-193b expression was significantly downregulated in HCC tissues compared to paratumor tissues (Fig. 6d) and reversely correlated with CD73 mRNA in clinical HCC samples (r = − 0.83, P < 0.001, Fig. 6e). Functional assays demonstrated that transfection of miR-193b could significantly inhibit HCC proliferation, migration, and invasion, and these inhibitory effects could be rescued by CD73 re-expression (Fig. 6f–h, Additional file 11: Figure S10C and D). Additionally, induction of epithelial-like phenotype and downregulation of phosphorylation of AKT caused by miR-193b mimic transfection could also be reversed by re-expression of CD73 (Fig. 6i). Taken together, our data identified miR-193b as a novel negative regulator of CD73 expression in HCC. We examined whether targeting CD73 in combination with A2AR inhibition would inhibit HCC growth independent of the immune system. Colony formation assays showed that co-treatment with inhibitors against CD73 and A2AR dramatically reduced cell proliferation in CD73high HCCLM3 cells, while inhibiting CD73 or A2AR alone showed moderate inhibition effects (Fig. 7a). Moreover, co-targeting strategy induced more apoptosis in HCCLM3 cells than targeting CD73 or A2AR alone (Fig. 7b). Targeting CD73 or A2AR alone in NOG mice caused moderate suppression of tumor growth in vivo. However, dramatic and more durable responses were observed in mice co-treated with both CD73 and A2AR inhibitors (Fig. 7c). Similarly, Targeting CD73 or A2AR alone caused moderate suppression of lung metastasis, while co-targeting strategy exerted a synergistic effect, resulting in maximal suppression of lung metastasis. (Fig. 7d). Our findings revealed co-targeting CD73 and A2AR exhibited potentials for preventing HCC progression and metastasis. CD73 plays a vital role in adenosinergic signaling by catalyzing AMP into adenosine . Hence, CD73 has been mainly studied for its immunosuppression functions and was identified as a novel immune checkpoint target with promising potential for suppressing tumor development [19, 35]. Meanwhile, studies also showed CD73 promotes tumor growth in an immune-independent manner [16, 17, 30, 31]. Here, functional experiments demonstrated that CD73 could promote HCC progression and metastasis. We also confirmed the clinical significance of CD73 as an independent prognostic indicator of TTR and OS for HCC patients after curative resection. Moreover, CD73 retained significant prognostic prediction value in early-HCC and AFP-low patients, whose clinical outcomes were difficult to predict by conventional indexes . 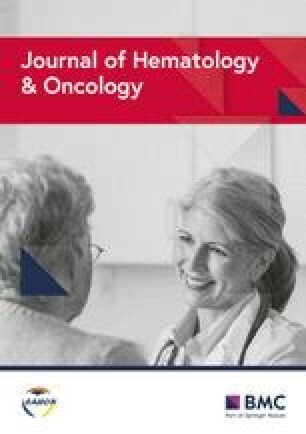 Our findings collaborated with the prognostic significance of CD73 in TCGA database (Additional file 12: Figure S11) and indicated that it might serve as an indicator to identify HCC patients at high risk of recurrence that require further interventions in addition to resection to improve their prognosis. EMT plays an important role in facilitating HCC metastasis, despite its controversial function during carcinogenesis . 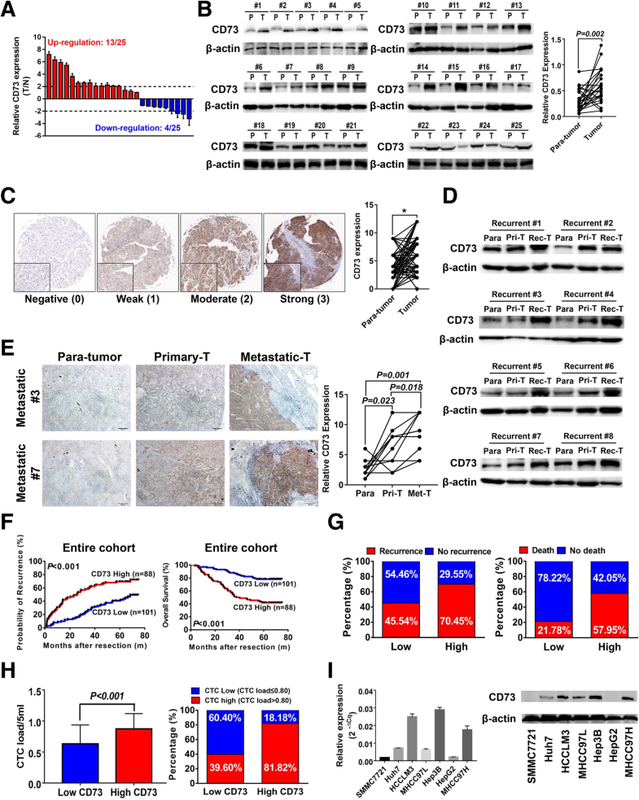 Previous studies reported CD73 as a critical regulator for the maintenance of mesenchymal traits in mesenchymal stem cells and ovarian cancer cells [16, 37, 38]. In the present study, we showed that CD73 expression was essential for maintaining the mesenchymal-like phenotype in HCC. Clinical samples confirmed our findings, showing that CD73 expression significantly correlated with EMT status. Therefore, we provide the first evidence demonstrating that CD73 serves as a trigger for EMT in HCC. Previous studies reported that CD73 exerted its functions by both enzymatic-dependent and enzymatic-independent ways . Here, we found that CD73 exerts its tumor promotion functions mainly through its enzymatic activity due to the significant changes in HCC cells after APCP or adenosine treatment. However, it should be noted that APCP showed a weaker effect on cell proliferation and invasion than CD73, although this difference did not reach a statistical significance. Similar results were observed when comparing adenosine with CD73 overexpression. These findings suggested the possibility of other regulatory mechanisms of CD73 beyond producing adenosine. Thus, our future work will examine the non-enzymatic functions of CD73 to elucidate the regulatory network of CD73 in HCC. A2AR is a critical receptor that is responsible for the function of CD73 in cancer immunity, and CD73-expressing cancer cells are prone to form metastasis loci via activation of A2AR, which results in exhaustion of natural killer cells within the tumor microenvironment [8, 13, 14, 19]. Here, we provided the first evidence that A2AR serves as the key downstream mediator of CD73 to regulate the progressive phenotype of HCC, and inhibition of A2AR dramatically abolished the effects of CD73 on HCC cells. Our data strongly demonstrate the non-immunosuppressive effects of A2AR, thus expanding our understanding of the function of A2AR in HCC development. Based on these findings, we speculated that co-targeting CD73 and A2AR might achieve satisfactory treatment effects in HCC. Indeed, CD73 inhibition in combination with A2AR blockade resulted in significantly decreased tumor growth as well as metastasis compared with controls. Since our findings were observed in immunodeficient mouse models, we hypothesize that this co-inhibition strategy might achieve more promising treatment response by not only blocking progressive traits of HCC but also restoring anti-tumor immune function within the tumor microenvironment. Abnormal AKT activation is a hallmark of tumor progression in various cancers, including HCC . In the present study, Alterations of pGSK3β and pAKT levels were observed. More importantly, FOXO3a, a well-established tumor suppressor in HCC according to previous study , was also greatly repressed due to CD73 expression, which served as solid evidence for AKT activation. Our findings were consistent with previous studies that CD73 activated AKT in breast and lung cancer cells [17, 30]. However, the underlying mechanism of how CD73 triggered AKT activation had not been elucidated clearly by previous studies. Here, we showed that the CD73-A2AR axis served as a “switch” for Rap1 activation, thus resulting in membrane localization of P110β and PIP3 production, which are critical steps for AKT activation. 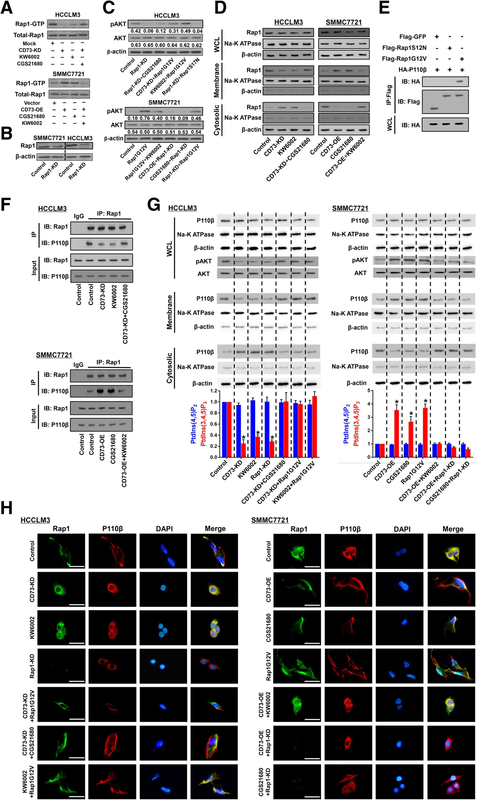 Rap1 is a central regulator of cell adhesion and motility, and aberrant activation of Rap1 can result in carcinogenesis and tumor progression . Importantly, Rap1 and Ras share similar binding partners, including PI3K . Our study not only confirmed the importance of Rap1 in HCC progression and metastasis, but also identified Rap1 as a key downstream responder of CD73-A2AR that recruits P110β to the plasma membrane. It was reported that cAMP acted as a key downstream molecule of GPCR and could induce Rap1 activation . Based on our Cignal pathway screening results, we also found that cAMP/PKA signaling exhibited significant changes due to CD73 alteration (Fig. 4a). Hence, A2AR might mediate Rap1 activation through promoting cAMP production, and detailed mechanism is currently ongoing in our lab. Previous reports also showed that CD73 was positively correlated with EGFR , and future studies should also examine their potential interaction in HCC. Regulatory network of miRNA-mRNA interaction was important for HCC progression. miR-193a was reported as a tumor suppressor and could be found in HCC cell-derived exosomes . However, miR-193b did not serve as a significant prognostic indicator from HCC-derived exosomes. The major explanation for this might be the different expression regulatory mechanism of these two miRNAs in HCC: low miR-193b expression might due to inhibition of transcription while low miR-193a level might result from selective packaging and secreting through exosomes. Therefore, it was rational that miR-193b could rarely be found in HCC-derived exosomes. Meanwhile, CD73 expression showed little response to miR-193a mimics transfection in our study. We speculated this phenomenon might result from different clearance mechanism of exogenous miRNA between miR-193a and miR-193b. However, our findings demonstrated that miR-193b was the major negative regulator of CD73 in HCC, and our future work will aim at clarifying the underlying mechanism of inhibitory difference between miR-193a and miR-193b. Our study demonstrated that CD73 was an independent prognostic indicator for HCC. Functional experiments established the essential role of CD73 in promoting HCC progression and metastasis through PI3K/AKT signaling by inducing Rap1-mediated membrane localization of P110β. We also identified miR-193b as a potential upstream regulator of CD73 in HCC. Notably, co-targeting CD73 and A2AR achieved satisfactory inhibitory effects on HCC in vitro and vivo. Together these results demonstrate the importance of CD73 in HCC in addition to its immunosuppressive functions and revealed that a CD73 targeting strategy may be a promising novel therapeutic strategy for future HCC management. We thank Prof Ji Yuan and Dr. Lu Shao-Hua from the Department of Pathology, Zhongshan Hospital for their help in pathological diagnosis. Also, we thank the participating patients for the source of clinical blood samples. Wei Guo was supported by the National Natural Science Foundation of China (81772263 and 81572064) and Key Developing Disciplines of Shanghai Municipal Commission of Health and Family Planning (2015ZB0201). Xin-Rong Yang was supported by the National Natural Science Foundation of China (81672839, 81472676 and 81872355), National Key Research and Development Program of China (2016YFF0101405), the project from Shanghai Science and Technology Commission (14DZ1940302, 1411970200, 14140902301), the Strategic Priority Research Program of the Chinese Academy of Sciences (XDA12020103). Jia Fan was supported by the National High Technology Research and Development Program (863 Program) of China (2015AA020401), the State Key Program of National Natural Science of China (81530077, and 81772551), Specialized Research Fund for the Doctoral Program of Higher Education and Research Grants Council Earmarked Research Grants Joint Research Scheme (20130071140008), the Projects from Shanghai Science and Technology Commission (14DZ1940300, 14411970200), The Strategic Priority Research Program of the Chinese Academy of Science (XDA12020105). Bei-Li Wang was supported by the Projects from Shanghai Science and Technology Commission (16411952100). Yun-Fan Sun was supported by National Natural Science Foundation of China (81602543) and the Sailing Program from the Shanghai and Technology Commission (16YF1401400). Bo Hu was supported by National Natural Science Foundation of China (8180101167 and 31771472) and Zhongshan Hospital Science Foundation (2016ZSQN30, 2017ZSQN18, 2017ZSYQ26). XLM, XRY, and BH contributed to the study design. XLM, BH, WJY, LHL, HW, YZ, CYZ, ALJ, and YFS contributed to the acquisition, analysis, and interpretation of the data. XLM, BH, and XRY contributed to the drafting of the manuscript. JZ, BSP, WG, XRY, and JF contributed to the critical revision of the manuscript. All authors read and approved the final manuscript. Present study was performed in accordance with the 1975 Declaration of Helsinki. Approval for the use of human subjects was obtained from the research ethics committee of Zhongshan Hospital, and informed consent was obtained from each individual enrolled in this study.